Attentiveness and effort are advantageous for realizing coherent, consistent visual intentions – reinforcing and driving the business enterprise mission and message. Organizational and procedural structures may be logically and rationally ordered. Alternately, robust appropriate visualizations can apprehend otherwise intuitive and sensible dynamics, while not systematically rationalistic, will be informed and forceful nevertheless. For any working venture, an image-visualization ideally can be communicated in a clean and cohesive manner, in complete and honest agreement with the nature of the work itself. In reality this probably seldom occurs. Last October near Los Angeles, Lincoln Wallen delivered an impressive presentation for a group of focus minded technicians with Storage Networking World and The Storage Networking Industry Association (SNIA). The CTO of DreamWorks Animation described the nuts and bolts background details supporting the latest filmmaking processes. “We want to get to the point where the experience was so obviously intuitive that you could imagine a child doing it.” A person would not necessarily expect computer network hardware specialists to appreciate imaginative visualization expertise. Each fragment of a film-track can exhibit one thousand assets, where each asset is a code instruction enforcing a depiction or a motion. The cloth for the sleeve of a jacket can appear to move and to behave differently than the arm inside of the sleeve. Using digital asset resources, an animation artist can create only about two or three seconds of film-time each working day. Then the room was darkened while the official teaser for “How to Train Your Dragon 2” was shown on the large screens in the convention hall. So here was a group of computer cloud hardware technicians – concerned with computer file sizes, computer processing speeds, and computer security protocols – sitting together watching an animated film clip about a supposedly dangerous monster zooming through billowing weather clouds in the sky, as the adventurous protagonist displays his skill in handling the challenges. Still, the curious consonance of image and reality at this moment passed without mention or recognition. This was not deliberately planned; it just was simply and strangely serendipitous, accidentally appropriate rather than intended. Jim Collins and Morten Hansen, authors of Great by Choice (2011), exercise metaphors like rock-climbing, in view of achievement, performance, and awareness of risk. Dov Seidman, with LRN, proposes a WAVE analogy, as an image appropriate for new business imperatives. His book is HOW: Why HOW We Do Anything Means Everything (2007, 2011). These types of approaches represent something freshly new on the event horizon. It is not unusual to find that other styles of expression -- analogies and metaphors -- would be familiar and acceptable at other times and in other places. These forms of understanding have not been in fashion with the normal dogma of business methods and means, in the near recent past. Lately, it has been more common for organizations to take isolated factors separately and to let these rattle along as happenstance occurs, while avoiding a viable sensibility of agreement and cohesion. Jim Collins and Morten Hansen offer rigorous ideas about Level Five Ambition, Empirical Creativity, Productive Paranoia, and Fanatic Discipline. Dov Seidman proceeds to examine business practices through themes of Self Governance, Intentional Behavior, Deliberate Thoughtfulness, and Tacit Knowledge. Ambition and Self Governance seem related together. Intentional Behavior and Empirical Creativity seem related – under the right conditions trust enables risk, which leads to innovation, which creates progress. Deliberate Thoughtfulness and Productive Paranoia seem related together. Finally, Tacit Knowledge and Fanatic Discipline seem related, as well. 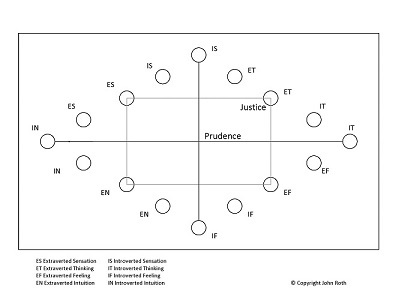 Separately with psychology, four cognitive functions have been conventionally formalized as general personal capabilities through the well‐established Myers‐Briggs MBTI framework: Feeling, Intuition, Thinking, and Sensation. The dynamics of Introversion and Extroversion are relevant here as well, inside-out against outside-in. However, if many differing considerations can become combined rather than independently separated, then a meaningful balance and coherence can become apparent. The conceptualization becomes challenging, since opposing alternatives are often seen as presenting hindrance rather than offering cooperative contribution. The conceptualization becomes challenging, since the deliberately nuanced qualifications can be seen to align with recognized traditional virtues, standing outside of a business context. The conceptualization becomes challenging, since business has come to be most popularly understood along a limited, narrow view – permitting only pure self‐interest and reflecting permissible conventional modes of behavior. The conceptualization becomes challenging, approaching the proposition that a beneficial fortune, Return on Luck <ROL> is enhanced through integration of all of these various dynamics in an advantageous, even enlightened, spirit of awareness. For Jim Collins and Morten Hansen, visualizations offer valuable guidance, if one cares to look or listen. One impressive realization emerges about the precise 10X Great themes involving Fanatic Discipline, Empirical Creativity, Productive Paranoia, and Level 5 Ambition. Each is a singular quality, yet also nuanced in actualization. Each situation respects and reflects the conditioning of other necessary factors and influences. The specific 10X principles reflect established understandings from the field of psychology, potentially giving the material wider scope and applicability. Jim Collins and Morten Hansen are interested in tangible dynamic process and performance. Dov Seidman is interested in optimal interpersonal organizational agreement. Throughout the HOW discussion, certain abstract concepts are uniformly conveyed through analogies. If taken out of context and presented without previous explanation, such pronouncements can seem strange and confusing. Who is this we? What constitutes a built‐up strong synapse with my next door neighbor? Is TRIP alignment like tire alignment? Are these waves in response to environmental preservation and energy conservation? The pronouncements are clearly not literal statements of fact. The intentional meaning may be something suggested somewhere behind or beyond the actual wordage. The trick is to try to suggest a purposefully intangible ideation – in relation to realistic conditions and circumstances.